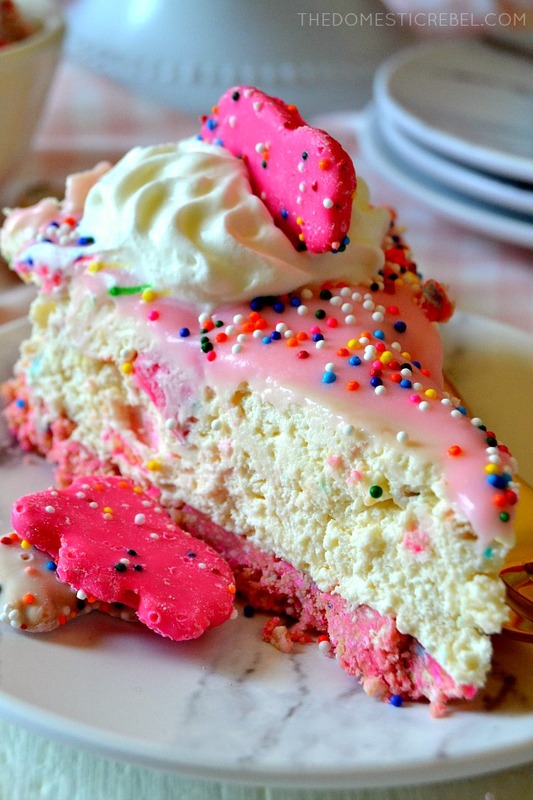 True circus animal cookie lovers will flip for this Circus Animal Cookie Cheesecake! 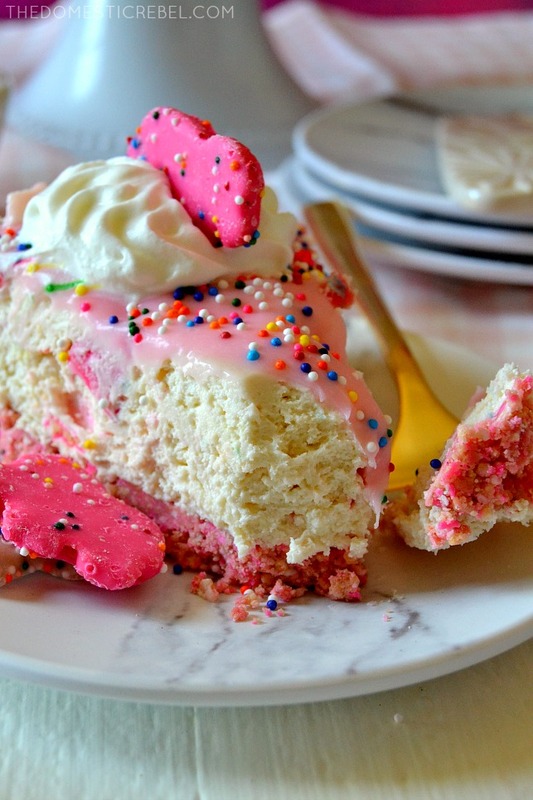 Loaded with amazing, authentic animal cookie flavor, this cheesecake is fantastic! I don’t know about you, but I am a certified circus animal cookie FREAK. I grew up eating them by the bagful while binge-watching Scooby Doo on long, hot summer days. My brother and I usually split the bag because we were a divided front: he only liked the pink ones, and I swore the white ones tasted better and were more sprinkly. Who knows if this is true, but it worked for our cookie-sharing relationship! 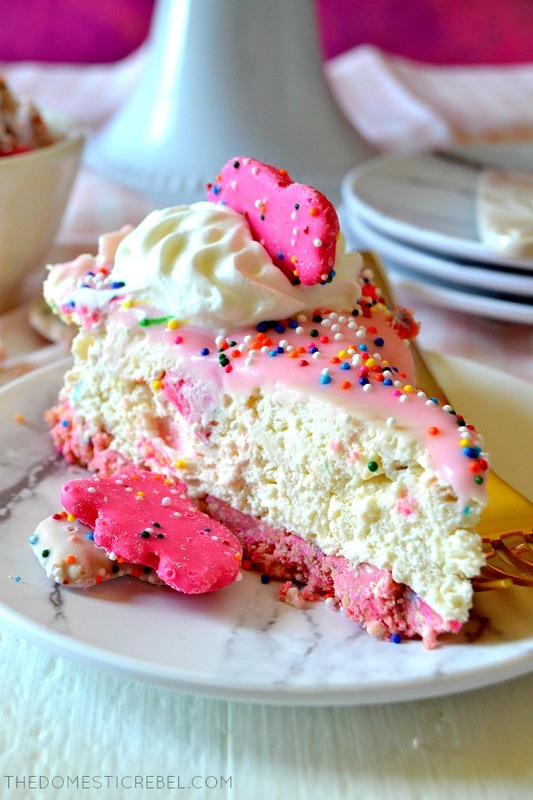 I’ve experimented with making circus animal treats in the past, but I knew I had to make an easy No-Bake Cheesecake featuring my favorite cookie! This cheesecake could not be simpler, and the entire thing is 100% no-bake! I loathe when I find awesome “no-bake” recipes and you have to bake the crust. 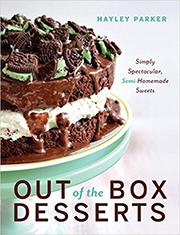 Um, call me crazy, but no-bake means NO BAKING! Duh? So when I say there’s no oven time, I mean it! Instead of baking the crust to set it, you freeze it which does the same thing. This minor switcharoo makes a world of a difference when the temps rise and you want to avoid turning on your oven. You’ll pulverize your circus animal cookies until they become a fine crumb, then mix them with a little melted butter so everything is moistened. Press it into a prepared springform pan and pop that sucker in the freezer for about 30 minutes. To amp up the cookie flavor, I swirled some chopped cookies into the cheesecake batter and spread the whole shebang in the pan. 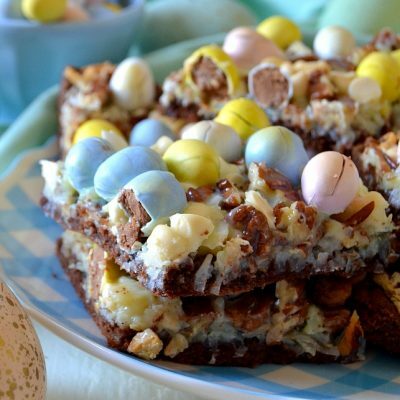 Refrigerate to chill, then add your white chocolate ganache, whipped cream, more cookies, and SPRINKLES! 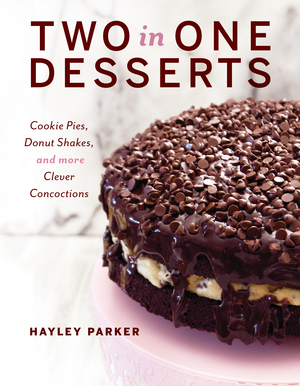 The result is a creamy, smooth, fabulously delicious and flavorful, sprinkle-laden cheesecake everyone will flip for! 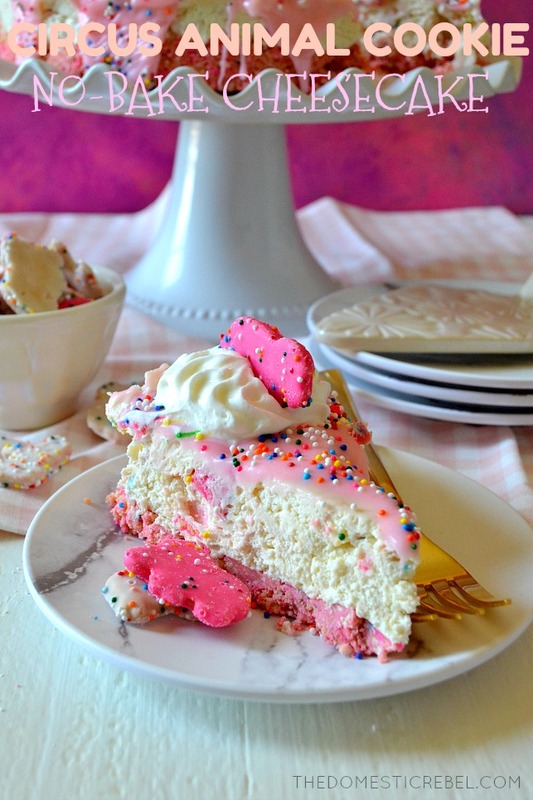 This Circus Animal Cookie Cheesecake is creamy, cool, fabulous, and entirely no-bake! Lightly spray the bottom of a 9" round springform pan. Place a parchment round in the bottom of the pan and spray the bottom and sides again. Set aside. In a large bowl, combine the cookie crumbs and melted butter and toss to combine. Mixture should be moistened. Press the mixture evenly into the prepared pan and freeze for 30 minutes or until firm. While crust chills, make your filling: Cream together the cream cheese, sugar, and vanilla in the bowl of a stand mixer until fluffy, 2 minutes. Melt the white chocolate chips and heavy cream together in a medium bowl for 30 seconds in the microwave, stirring until melted. Beat in the melted white chocolate until combined. Lastly, fold in the whipped topping until fluffy. Gently fold in the chopped cookies. Spread the cheesecake mixture evenly into the prepared pan and smooth out the top. Refrigerate for 4 hours or until firm. To make your ganache: pour the heavy cream into a microwave-safe bowl. Microwave for 30 seconds or until hot. Pour the hot heavy cream evenly over a bowl of the white chocolate chips. Let the mixture sit, undisturbed, for about 2 minutes or until melted. Stir until smooth. Use one drop of pink food coloring to tint the ganache a light pink color. Pour and spread the ganache evenly over the top of the cheesecake. 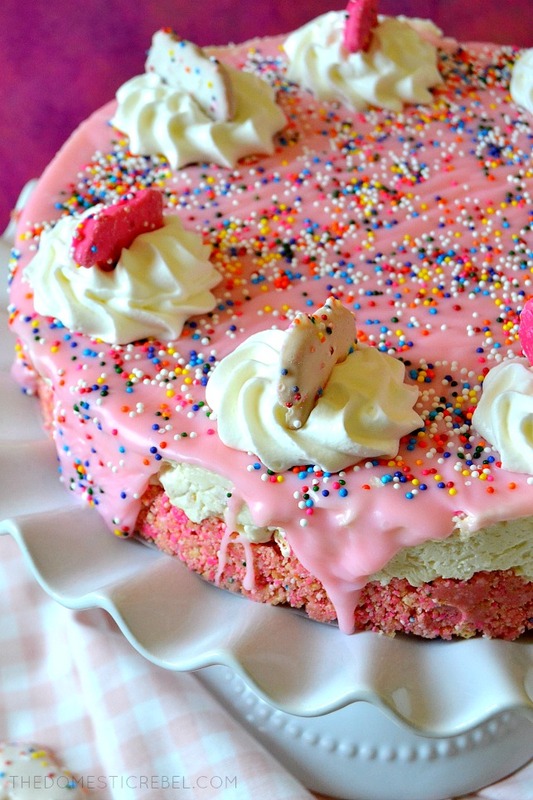 Immediately top with the rainbow non-pareils sprinkles. Let ganache set for about 30 minutes before serving. Just before serving, pipe a little whipped cream around the edges of the cheesecake and garnish with whole animal cookies. Store leftovers covered in the fridge. Hi Hayley! Making this beauty right now… in fridge chilling for four hours… when do I take it out of the springform? Before ganache? Thanks for the help and recipe! Can’t wait to serve it! Hi Wendy! Yes, before ganache! I’m having trouble finding this particular type of cookie in stores, where did you get them?? Hi Joanna! Most grocery stores should carry it – on the west coast it’s by Mother’s Brand, but usually stores like Target have their own version!